If you are looking for market research companies or focus group facilities in Los Angeles, QUALocator allows you to search and find your best market research options quickly. QUALocator offers some of the best brick-and-mortar sites with rooms and space ideal for conducting market research. QUALocator’s directory also offers technology providers to facilitate virtual In-Depth Interviews (IDIs) and Market Research Panels. 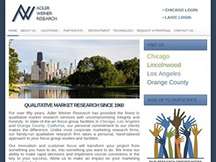 QUALocator offers three market research venue providers in Los Angeles, California.